"Cosmos: A Spacetime Odysssey" on Fox Begins Tonight, Sunday March 9th at 9pm! For a program like Fox's new version of the classic Carl Sagan science series Cosmos, images are worth billions and billions of words. Behold! 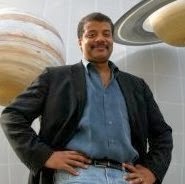 deGrasse Tyson plays the role of host, and he's the perfect blend of egghead, enthusiast and TV-friendly expert that this show needs to reach out to a mass audience. Follow him on Twitter here, and listen to a great recent interview on NPR here. At a time when Science is frequently under assault by a certain vociferous slice of the population (especially in America, where sadly it's not merely a philosophical debate but one often framed by money and self-interest), Cosmos could play an important part in re-igniting the wonder that makes us appreciate our precarious and precious place in Space. Indeed, the planet is groaning under the collective weight of intellectual apathy and outmoded superstitions. Bring it on, Cosmos! Predictably postive reviews out there already for the show, including this one from Maureen Ryan at Huffington Post which includes a charming paragraph about the reactions her young son had; this from USA Today, The Los Angeles Times and The Christian Science Monitor. Many more out there, of course. The 13-part Cosmos: A Spacetime Odyssey airs tonight at 9pm on the combined Fox networks and then only on Fox proper for the rest of the episodes, with extra-footage encores appearing on the National Geographic Channel at 10pm Monday nights and also 10pm Fridays.